This is a quadruplicate Field Change Order form printed up by the Administration of the 1933 World's Fair. It measures 8-1/2" x 11" and there are forms in blue (Field Superintendent - A Century of Progress copy), pink (General Superintendent - A Century of Progress copy , white (Design Division copy) and yellow (Contractor's copy). 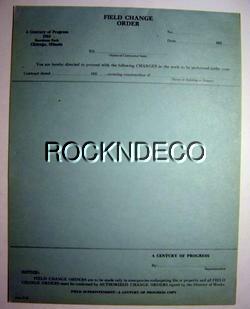 This is an internal form that would have used to approve changes in construction of buildings or projects at the fair. 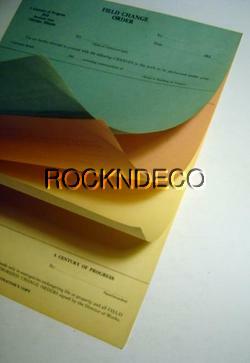 The form is unused and in very good condition. Postage is $5.00.